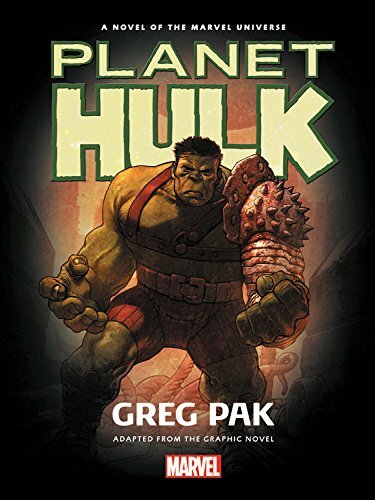 In October 2017, Marvel published a prose novel adaptation of PLANET HULK comics storyline, written by Greg Pak, also the writer of the original comics. The PLANET HULK prose novel is Pak’s first novel and can be bought right here at Amazon. We’re coming to the end of 2017, and I’m ready to kvell a bit. Here’s a list of the work I’m the most proud of in 2017. Hope ya dig! MECH CADET YU tells the story of a janitor’s kid who bonds with a giant robot and joins the elite Sky Corps Academy. Drawn by Takeshi Miyazawa with colors by Triona Farrell and letters by Simon Bowland, the book was originally approved as a four issue miniseries. But because folks like you went nuts for it, BOOM! Studios upgraded it to an ongoing series! I’m not supposed to say which children are my favorite. But you guys, MECH CADET YU is my favorite. I absolutely love working on the book, I love all my creative collaborators, and I love our kid heroes and all their robots and all the monsters and mystery surrounding them. Ask your local comics shop to order the first trade paperback and issue #5 for you today — both hit stores on January 10! The PLANET HULK PROSE NOVEL came out in October, and it’s my very first prose novel! I loved every minute of working on this book and I won’t lie — I think it’s pretty great. If you loved the original PLANET HULK comics, the prose novel’s full of extra development and revelations and a bit of a shocker of an ending that you won’t want to miss. If you’ve never read a Hulk comic in your life, I humbly propose that this novel might be a great introduction to the massive emotion and glory of the character. And holy cow, you can get it for JUST TWO DOLLARS right now for the Kindle! TOTALLY AWESOME HULK #15, drawn by the great Mahmud Asrar with colors by Nolan Woodard and a stunning cover by Stonehouse, may be one of my favorite single issue comics I’ve ever written. It starts the “Big Apple Showdown” storyline, which is most infamous for featuring what I’m pretty sure is the biggest team-up of Asian American superheroes ever seen in mainstream comics. I adore my editors for letting me follow this crew of heroes around as they perform at an Asian American bone marrow registry awareness benefit, get Korean barbecue, fight over the check, and sing karaoke before defending New York from an alien invasion. I love it for the diversity within diversity, with Asian Americans of different backgrounds and generations discovering their conflicts and similarities. And I absolutely love Mahmud’s and Nolan’s gorgeous art, which brings out all the emotion, action, and sheer fun of the story. And you can buy the collected digital volume (which also includes a two-issue story co-starring the great Jeremy Lin) for a scandalously discounted price of just $2.75 at Amazon/Comixology today! So a little movie called THOR: RAGNAROK hit movie theaters this week, and I’m thrilled to report that it’s fantastic — and that it’s inspired in part by the PLANET HULK story that I wrote and Carlo Pagulayan, Aaron Lopresti, Gary Frank, Chris Sotomayor, Mark Paniccia, Nate Cosby, Randy Gentile, and many others worked on for Marvel! Here’s a fun article from Vulture in which Abraham Riesman interviews me and editor Mark Paniccia about the making of the original comics. Here’s a fun list of PLANET HULK influences on the movie. Here’s a new review of the original PLANET HULK comics. And of course, this is a fantastic time to buy the PLANET HULK graphic novel and the PLANET HULK prose novel! I’m biased, of course, but they’re both great! Enjoy! 2017.10.05 – 10.08 – Greg Pak’s schedule for the New York Comic Con! I’ll be at the New York Comic Con all four days! I’ll spend most of my time in Artists Alley, E28, where I’ll have copies of many of my books, including MECH CADET YU #1 and #2, KINGSWAY WEST, and the new PLANET HULK prose novel! Here’s my schedule — hope to see you there! Comments Off on 2017.10.05 – 10.08 – Greg Pak’s schedule for the New York Comic Con! 2017.09.22 – 09.22 – Greg Pak at the Baltimore Comic Con! Thrilled to share that I’ll be a guest of the Baltimore Comic Con this weekend, attending Friday, Saturday, and Sunday. I’ll be at table 208 in Artists Alley with tons of comics, including MECH CADET YU, KINGSWAY WEST, BIG TROUBLE IN LITTLE CHINA/ESCAPE FROM NEW YORK, PLANET HULK, TOTALLY AWESOME HULK, and tons more! Comments Off on 2017.09.22 – 09.22 – Greg Pak at the Baltimore Comic Con! Tags Planet Hulk | Comments Off on Greg Pak’s writing a PLANET HULK prose novel, in stores this October!